Austin Robotic Surgeon | Dr. Francis Buzad, Epicenter Surgeon. Experience. Precision. Care. As an epicenter surgeon, Dr. Buzad offers the least invasive options to the greatest variety of patients. 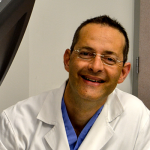 With a strong commitment to advancing robotic surgery techniques, he is trusted by other surgeons to teach robotic surgery techniques. Dr. Francis Buzad is a leading expert in robotic and general surgery in Texas, recognized as the first epicenter robotic surgeon in Texas and a recognized international speaker on innovation in surgery. Currently serving patients in Central Texas from The Austin Diagnostic Clinic, Dr. Buzad successfully addresses a broader variety of cases through minimally-invasive procedures. As the first epicenter surgeon in Texas, Dr. Francis Buzad offers the least invasive option to the greatest variety of cases, procedures and body types. Currently serving patients from The Austin Diagnostic Clinic, Dr. Buzad also trains other surgeons on robotics, worldwide, is part of the Texas Institute for Robotic Surgery and is an international speaker on innovations in his field. Robotics makes is possible to help a much larger group of people so they can benefit from minimally invasive surgery. Like laparoscopic surgery, robotics offers the benefits of minimally-invasive surgery, but extends it to a wider variety of patients. Dr. Francis Buzad has become the first general surgeon in the world to use the latest advance in robotic surgery capabilities. The advancements of the Da Vinci Xi include advanced docking capabilities, increased instrument and camera reach, fully interchangeable instrument and camera arms, advanced surgeon interface and many other software and hardware improvements, making it the most capable computer assisted surgical tool in the surgeons’ hands. There is virtually minimal intraabdominal pathology that this system cannot approach with the utmost precision and dexterity.